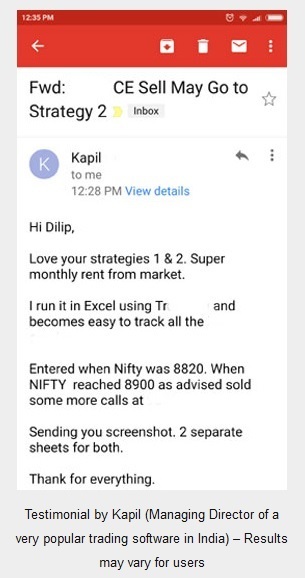 You must have got some idea about ratio call write strategy by the name itself. Basically it is selling options against futures or stocks. Frankly these kind of positions work only if your view is right else there can be unlimited losses. Whenever in any trade there is a chance of unlimited loss, I get uncomfortable. Though I agree at some point we will take the losses out by getting out of the position, but the potential damage it can do by that time is unknown. Since the damage is unknown, I usually do not get into these kind of positions. Actually its in-built now, all these unlimited loss trades or speculative trades does not exist for me. 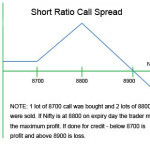 But ratio call write trade is one of those better trades, and I feel if this article helps traders looking for ratio call write trade, then that would be great. Ratio Call Write is somewhat like a covered call but comes with a slight twist. Covered calls are usually done on stock vs. options i.e buy stock and sell call. However buying stock and selling call is not unlimited risk. Here we will see why a similar trade is at unlimited risk. The view of the trader is that the stock will stay in range for the next few days and the volatility will fall. Even if the stock falls or rises by a couple percent points the trader may close this trade for a profit. Which means if the trader buys 1 lot of Futures, he needs to sell 2 lots ATM Call options. If he buys 2 lots of futures, he needs to sell 4 lots of ATM call options. Note that in covered calls only the same number of ATM/OTM call option is sold, but here the trader sells double the number of call options. You must be thinking this is a better trade than the covered call because not the same number but double the number of options are sold, but you will be surprised to know what may happen. In short, if risk is concerned, covered call is a better trade than ratio call write. Now let me do a real paper trade to help you understand better how you will make profits and how you may incur losses. Note: None of the other websites which teaches the Ratio Call Write Strategy will tell you the hidden price of Futures while explaining this trade. As you can see even though Nifty Spot is 8700.00, a trader has to pay a premium while trading Futures. Though Nifty is at 8700, the Future is traded at 8772. A difference of 72 points. Mind it, this is a significant issue and cannot be ignored. This can significantly impact the profit and loss of the trade. Therefore its highly recommended that this trade should be done in cash holding of a stock. Yes you may need a lot of money to trade this with real stocks in your Demat account, but it will be less riskier than doing it with Futures. If you are thinking why you need to pay a premium to buy/sell futures than the answer is Volatility, Time and prevailing Interest Rate. By trading in Futures you are getting a leverage. 8700*25 = 217500. You need this much cash to buy Nifty 1 lot if Nifty was a stock. But by buying a Future you are getting the same benefit if the Nifty appreciates. And how much cash is blocked? Approx 14,000. Which means you are saving more than Rs. 2 lakh per trade. Who will pay for the interest earned on that money? The Future trader, in the way of premium. Also, it is not justified if someone buys a stock by paying the full in cash, and someone buys a Future by paying just 10% of it – and make the same profit in the same movement. There should be some justification. Therefore the Future trader pays a premium. Of course on the expiry day both the Future and the stock will show the same price. Excited? Well don’t get too excited because markets are priced in such a way that arbitrage opportunities are rare now a days. But if you search seriously you may get a couple of trades every month. One day I will write on arbitrage trades, but for now lets leave it. Coming back to the trade. Now imagine a situation where Nifty did not move much and stayed at around 8700. See how the Futures will eat into the profits. Both the lots of 8700 March Call Option will expire worthless. The trader gets to keep Rs. 8000.00. BUT Future will also be at 8700. Loss from Futures 72 points. 72*25 = 1800. Total profits: 8000 – 1800 = 6200. Imagine Nifty to be a stock and also imagine the trader buying Nifty shares at 8700. Now he is at zero loss from the shares, but full Rs. 8000 profit from the call options sold. With futures the premium he paid has gone. Imagine losing this money trade after trade plus the times he made a loss. Future premium will only add to his agony every time he trades this. Hope its clear that if the stock does not move, the trader will make profit in the Ratio Call Write strategy. Do you really think for a period of 30 days Nifty will not move? No that is not going to happen. Now coming to the difficult situations. The trade break even is option premium received from selling the calls on the lower end and profits coming from the Future covering the loss till break even is reached, on the upper end. In the lower end it is: 160 * 2 = 320. Why we are considering the Futures price, why not Nifty spot? Because your profit and loss will be calculated on the Future price NOT the Nifty spot when you initiated the trade. Loss from the Futures: 8452 – 8772 = -320 * 25 = -8000. Both the sold call options expire worthless: Profit = +8000. Total profit or loss: 8000-8000 = 0. Which means break even on the downside is 8452. If Nifty keeps falling even after reaching 8452, the trader is at unlimited loss. Calculating this is a bit tricky as we have two sold options, not one. Remember the max loss that can be covered is 320 points but there are 2 options so break even on the upper side is: 320/2 = 160 + 8772 = 8932. Profit from the Futures: 8932 – 8772 = 160 * 25 = 4000. 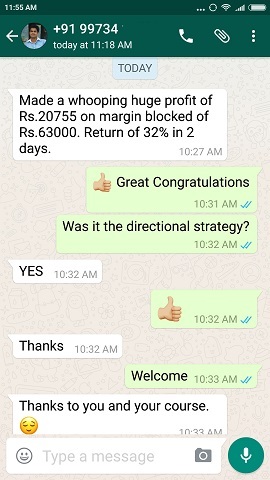 Loss from the sold call options: 8700 March Call Option will be at: 8932-8700 = 232. Total profit or loss: 4000-3600 = 400. (Note that on the upper end it is very difficult to get a zero profit or loss because there are two options sold, so the loss multiplies by 50 but the profit multiplies by 25.) Still consider this as break even. Which means break even on the upside is around 8932. If Nifty keeps going up, the trader is at unlimited loss. Best is to write ATM calls expiring in next 30 days because they have little time value. If stock does not move much even for a few days the erosion of premium of the sold options will be significant as they are ATM and the trader can exit in profits. It depends on the comfort level of the trader, but as a conservative trader for me 2-3% per trade is good enough. Whatever, never wait till expiry, any day you see a good profit just exit. Why Ratio Call Write strategy is better than buying/selling naked futures? 1. There is a big room for profit: In the above trade the room is from 8944 to 8464. 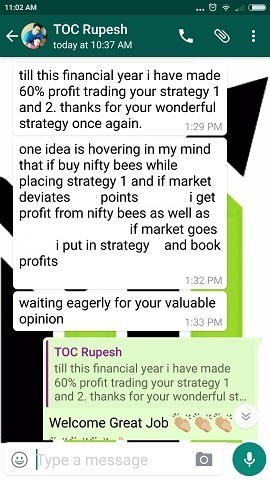 If Nifty is anywhere between this on expiry day the trader can be in profit. 2. Whether Nifty goes down or up the trader will feel safe at least until 8944 or 8464 gets breached. 3. If some time passes and Nifty has fallen only a few points the trader can still exit in profits, because the time will eat some premium from the options sold. 4. This is not trading in a panic state of mind. Though not conservative, this trade is still better in terms of keeping stress under control. 5. Still this trade is a unlimited loss strategy so at least I do not recommend it. However if you own real stocks (not Futures) this trade can be traded. Because if the stock falls or does not move the trader makes great money. However if stock keeps rising, the trader can exit one of the call option at a small loss and convert this trade into a covered call. 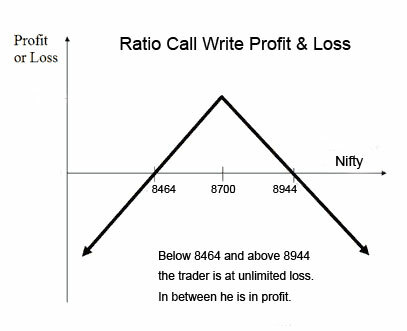 Ratio Call Write is a strategy where traders owns stock or futures and sells double the lots of call option against the no of lots of Futures. The idea is to take profits from the sold high premium ATM options. 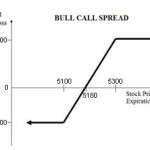 If stock rises, the trader needs to take stop loss in the calls sold or exit the trade altogether. If stock falls the trader can book profits in the sold options and can again sell the options of next month. There is a big room for profit in this trade. Unlimited risk, so be careful. Calculate your break even points both sides and get out if breached. Have you ever sold 2 call options against Future buy? If yes please tell us your experience. WHAT IS ABOUT BROKERAGE OF BROKER? THIS WILL AFFECT BADLY 0N 3 % RETURN. HOW MUCH IT IS PROFITABLE AFTER BROKERAGE? IS IT POSSIBLE TO ADD MORE (SELL 2 ATM PUT OPTIONS) IN YOUR STRATEGY ? Have you heard about discount brokers? They are the ones who DO NOT give any tips or suggestions and they do not have offices in every city. Due to this the brokerage cost gets reduced significantly. For example in India there are many option brokerage houses who charge a fixed amount every month or Rs. 20/- per F&O trade. So even if you buy 100 lots of Nifty Futures or Options the only money you pay is Rs. 20/- + STT per trade even if all the lots gets executed at different times. 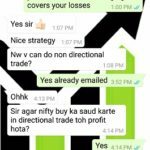 My strategies are not Intraday, they are positional. You trade 10-12 trades in a month. So effectively with a discount broker you end up paying only Rs. 240+STT per month even if your account is 1 crore. This is next to nothing. Hope that clears the confusion 3% per month is a great return. Coming to the next question – it is not about selling how many lots – it is about what happens if Nifty starts rising. Great if you sell more lots and Nifty does not rise, but if it does you have to deal with all those extra call options that you have sold. Hope you understand selling more is not recommended. Hi Dilip.. Your calculations are wrong on max profit and also your consideration of ITM option price on closing basis is not practical. Can you please tell specifically which calculation is wrong? Yes options do not close at exactly 100 on the expiry. I think for intrinsic value of 100 it closes at 95. But almost every website out there takes the value of 100 to keep the maths simple. This happens at around 3.20 pm expiry day. So its not a big matter of concern. But other than that please let me know where the calculations are wrong. here its 5900 not 6200 … you are man of 3% and you can do a mistake of 5% 🙂 recheck all..
Babu may be I am missing something. 8000 minus 1800 is 6200 not 5900. 2. The Max profit under Ratio Call Write is the Net Premium Recd.. and is achieved when the price of the underlying (the Futures) = Strike price of the short calls. Therefore, in this scenario, if the Nifty closes at 8700 there would be a loss of 84 pts as mentioned above; whilst the short calls expiring worthless would fetch 160 x 2 = 320 pts (Rs. 8000). Therefore 320 – 84 = 236…. translated to Rs. 5900 (236 x 25) would be the maximum profit; even as the losses would be unlimited beyond the Upper and Lower Breakeven (BE) pts. 3. Since the BE pts are the strike price of the short calls plus/minus the max profit points…. the correct BE pts on the lower end is 8700 – 236 = 8464… which you have correctly mentioned (albeit arrived at in a different way)…. and subsequently the upper BE would be 8700 +236 = 8936….. and not 8944 as indicated by you. Explained further : BE on the lower end : 8464 – 8784 = – 320 nullifies the +320 gained from the short calls…. and BE on the Upper end 8936 – 8784 = + 152 nullifies the – 152* lost on the short calls. Hope this explanation would clear the tangle. Indeed… Option calculations are such a maze that it beats the best of brains to workout the results in an instant. I myself took quite some time to know where the miscalculations lay. No issues…. these things happen.. and I would be only too happy to see you doing your best to impart these educative series and come up with more and more such strategies to make the serious trader lose less and less. Well I am a human and to err is human. I have rectified the mistake. To make things simple for a beginner I have changed Nifty Spot to 8700, and Futures to 8772. I then recalculated the BE, profit & loss. Hope now the issue is resolved. Thanks Allen for a detailed explanation. Note: Indian traders want to see profit and loss – most of them do not understand points and other stuff – therefore in most of my articles I give emphasis on P&L rather than points which the advanced trades look for. My website is mainly to help retail traders with families who do not get good information on options trading (at least in most websites in India) and unfortunately lose money trading. I also try to keep the language as simple as possible for everyone to understand. So don’t look back dear Dilip…..carry on the good work.! Heavenly blessings be upon you and your family. Thank You so much for the kind words Allen. 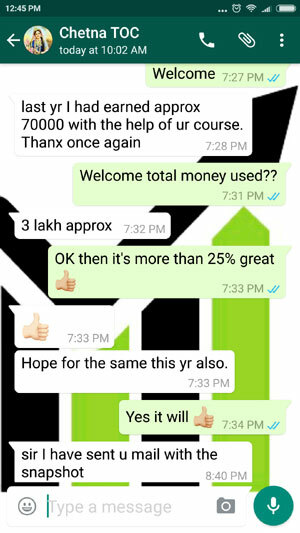 If I can help even one family from this blog get knowledge to invest right, my job is done. Looking at the stats average time on the site is around 6 minutes. Some read the whole blog in 1 day – means they read every page one by one the whole day. It makes me happy to see that. Whether they take my service or not – really not a concern. Whether they listen to what I have to say – is a concern. I am sure most are. I feel bad seeing retail investors lose their hard earned money to unnecessary speculations in option trading due to lack of knowledge. I was one of them a few years back. The worst is when they lose so much money which could have significantly improved their families’ quality of life in general and their kids quality of education in particular. If God comes and give me power to do just one thing – I will ask him to give knowledge (not money else they become lazy – if you want money work hard and earn it) of everything to everyone. It significantly improves quality of life.